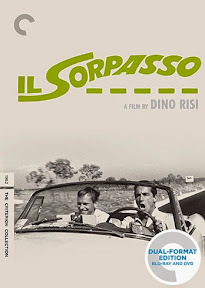 The title of film critic turned filmmaker Dino Risi’s bold 1962 consumerist commentary disguised as a road comedy Il Sorpasso translates in Italian to the dangerous driving maneuver called “the overtaking,” which references the country’s then-popular trend of taking over the position of the car ahead of you on the roadway by passing it at high speed. Culturally limiting, in other countries the film was given more descriptive titles ranging from France’s The Braggart to The Easy Life in the United States where undoubtedly art-houses were still trying to cash in on the success of Fellini’s La Dolce Vita. But when you consider how quickly Italian audiences were overtaken by the film – turning it into such a powerful word-of-mouth breakout hit that despite only selling fifty tickets on day one, two days later theater owners had to turn people away at the door – the decision to give Risi’s work such an offbeat yet nationally specific titles seems particularly fitting in retrospect. 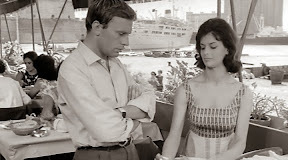 Yet while viewers in his own country gravitated to it lira-over-fist, it took critics a full decade to appreciate Il Sorpasso for the groundbreaking cinematic touchstone that it was, which (much like the subtlety of the weight carried by the true meaning of the title) is part of its charming mystique. Essentially only the second veritable Italian road picture after Rossellini’s 1954 Journey to Italy failed to find an audience, part of the reason Sorpasso worked so well was because the timing for a new kind of Rome, Open City was long overdue. Having moved away from the gritty post-war neorealist tales of economic woe as well as the broad-edged energy of the commedia all-italiana school— Il Sorpasso was that tricky indefinable work that didn’t easily adhere to any of the trends in Italian filmmaking from the wandering camera and existential angst of Antonioni to Fellini’s Avante-garde tales about the rich and hedonistic. 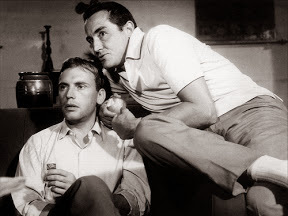 As a former film critic well-versed in American cinema and with a particular fondness for the bittersweet dramedies of Billy Wilder as well as the teary laughter of Charlie Chaplin, Risi (who’d also previously studied psychiatry), had a very international humanistic outlook which shows throughout Sorpasso. 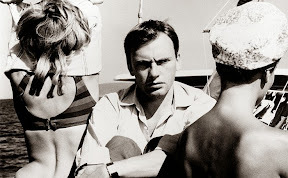 And given not only Risi’s similarities in background but also his decision to cast a French actor in a lead role (Jean-Louis Trintignant, filling in Jacques Perrin), I was surprised by how much the tone of this indisputably Italian film felt like a distant cousin to French New Wave critics turned filmmakers Jean-Luc Godard and François Truffaut’s Breathless. And perhaps paying indirect homage to Breathless as well as deriving influence from the melancholic undercurrent that’s always gone hand-in-hand with even the most manic of Italian comedies, Risi serves up Sorpasso with an audacious yet fitting finale (that likewise may have inspired Easy Rider in its own turn). 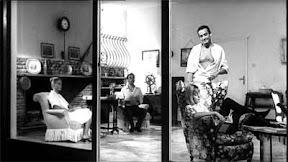 Even though Risi does poke fun at some of his contemporaries as Vittorio Gassman’s loudmouth Bruno states that Antonio’s L'Eclisse put him to sleep, the filmmaker also employs the same De Sica and Rosellini-esque Neorealist roots of layering his work with subtext (but with the lightest of touches). While you can view this title about a middle-aged impulsive adventurer who forces a young studious stranger into going on a two-day trip around the Italian countryside as a character study rolled into a “journey” film of allegorical, metaphorical and literal meaning (not unlike Jim Jarmusch’s Stranger than Paradise two decades later), Risi laces Sorpasso with a commentary about Italy’s new economic boom. With more people than ever before able to indulge in the expenses of the sweet life, as the characters venture further outside of Rome a gentle culture clash ensues as they compare the city to the country, coming face-to-face with everything from a country dance to long-estranged family members who are making life decisions based on money. From the question of just where and why they’re racing around with this need to flee and overtake (and from what) to an ahead of its time commentary about the alienation of people as Bruno laments that he’s never had a real friend, Il Sorpasso paints a thought-provoking picture of a specific time and place. 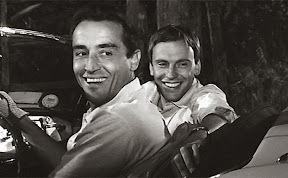 And by allowing his cinematographer and editor an unusual amount of generosity to show us the lives of extras and the goings-on of people and cars at the edges of the frame, Sorpasso’s exploration of the evolving attitudes not represented by our male leads help add extra warmth and humor to the what might have been a much too somber canvas. Gorgeously restored by The Criterion Collection for this dual format Blu-ray/DVD three-disc combo pack release complete with an intriguing introduction by Sideways helmer Alexander Payne that opens your eyes to new details, vintage clips and interviews such as a fascinating French television segment with Trintignant that takes you behind-the-scenes of the personalities behind the film, Il Sorpasso also boasts another collectible essay filled booklet. 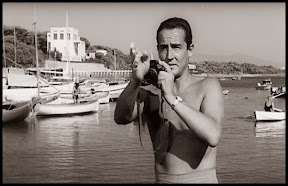 Technically speaking, of course, the flawless transfer of Alfio Contini's black and white cinematography evidenced in the feature presentation is the real star. 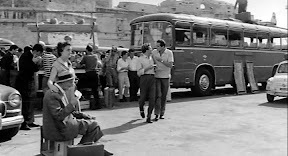 However, the booklet, which features an in-depth analysis of the film as well as a scholarly study of Italian cinema in its Golden Era from 1960-1963 is sure to send you looking for more Criterions to explore in the hopes that you’ll find yourself as overtaken with delight as you are when you buckle up for Risi’s classic.